How to Deal with Bullying — 5 Tips for You, 5 Tips for Your Children - Energetic Juniors - Contact Us! Bullying is, unfortunately, not uncommon. The worst part is that it never truly goes away. Your siblings may bully you, classmates may bully you; even when you grow up, coworkers may bully you. Anyone who claims to have never been bullied in their life has probably witnessed it happening or have been the bully themselves. There isn’t anything that can be done to completely stop bullying. However, we learn how to deal with our individual situations, as we grow up and mature. But what about when your children become the target of a bully? What can you tell them that will help them handle the situation, and what can you do to help? Be a Good Example for Them. Treat those around you with respect. This isn’t just your family and loved ones, it’s everybody. For example, if the pizza delivery guy brings the wrong order, don’t verbally beat him down. Your children witness your behavior and emulate it. If they see you treating someone else like he or she is below you, your children may start doing the same thing to their classmates. Explain what Bullying is to your Children. Don’t wait until the situation comes up. Make sure they know that bullying is wrong, and what to do if they experience or witness it. Let Them Know that They can Come to You. Make sure they understand that they can come to you, if they are the victim of bullying. Victims sometimes feel ashamed. They need to know that someone is willing to listen, and take action, to help them. If the Bullying is Already Taking Place, Take Action. This doesn’t mean you have to go and personally put the bully in his place. If the bullying is happening at school, report it to a teacher or the principal. 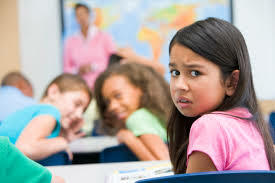 If it’s taking place outside of school, you may try contacting the bully’s parents and talking to them. Careful how you approach them, as parents have a tendency to assume the best of their child. Keep Calm. However you decide to go about trying to handle the situation, remember to remain calm and handle it in a mature manner. Handling it aggressively will only teach your children to handle future problems in a similar style. Let Others Know that You’re being Bullied. There is no reason to feel ashamed because you are being bullied. It may feel like you’re the only one dealing with this, but it’s actually quite common, and others are willing to help. Go to a Crowded Area. Bullies tend to not like witnesses to their deeds. If one starts to call you out, and is not physically restraining you, then make the situation public by moving into the crowd. Band Together with Your Friends. It’s easy to intimidate a lone victim, but it’s much harder to take on a group. Stick with your friends. Support them when they need it and they’ll support you back. Don’t Stoop to Their Level. It can be very tempting to try and get back at a bully by resorting to bullying yourself. However, all that you’re doing is keeping the cycle going. Eventually, you’ll just get the attention of an even bigger bully. Build Up Your Self-Esteem. Bullies tend to focus on those who are unsure of themselves and doubt their own abilities. In the end, you are the only one who can allow your self-esteem to be diminished. If you are having trouble keeping your self-esteem up by yourself, then you may try speaking to a counselor about it. They are there to help.